Recent release “Personal Reflections from the Heart, Mind, Body and Soul” from Page Publishing author Patience is a memorable collection of verses that delves into one’s personal strength and determination to overcome the trials and the lingering darkness within. Patience, a successful published author and writer, has completed her new book “Personal Reflections from the Heart, Mind, Body and Soul”: a gripping opus that tells the author’s painful and tormenting moments in life and how she found healing and acceptance along her journey. Published by New York City-based Page Publishing, Patience’s beautifully written masterpiece also declares her faith in God for his love, grace, and healing power throughout her life’s trials and struggles. 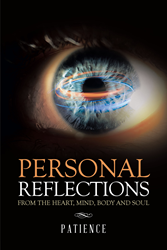 Readers who wish to experience this metaphorical work can purchase “Personal Reflections from the Heart, Mind, Body and Soul” at bookstores everywhere, or online at the Apple iTunes store, Amazon, Google Play, or Barnes and Noble.